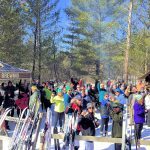 22nd Annual Junior Muffin Pursuit Races – Classic/Freestyle – The longest standing juniors race in Michigan, the Muffin Race will be held at Cross Country Ski Headquarters on Sunday, March 2nd. The race is a Junior Girls & Boys 8km Pursuit race. 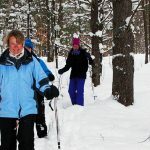 Skiers will classic ski the first half of the race then ski freestyle the second half of the race. Registration begins at 9am on Sunday, and we will shoot for a 10:30am start. This is a Michigan Cup Junior Race. Medals will be awarded to the top 3 finishers in the girls and boys races. After the 8km Senior Muffin Division Pursuit race, we will hold three Junior Muffin freestyle races: Ages 6 years and under, 7 to 9 and 10 to 12. All racers 12 and under will be awarded a medal! There is a $10 entry fee for the Senior Racers (13 and older) and it includes a Pig Roast Lunch. There is no entry fee for the Junior Muffin Racers.